1938 was hardly a banner year for the American film industry. It had its notable films, but it was a very tumultuous time for studios. With World War II looming on the horizon, the political climate in Europe was beginning to interfere with foreign distribution and things weren’t much better at home, either. Box office attendance was dwindling, a fact that couldn’t solely be blamed on the economic situation at the time. The idea of going to the movies was beginning to lose its appeal to many people because they were afraid they wouldn’t get their money’s worth. While industry insiders were desperately looking for ways to get people back into movie theaters, the Independent Theater Owners Association (ITOA) responded by putting the blame on certain film stars and the studios for paying them what ITOA considered to be inflated salaries. On May 3, 1938, ITOA published a now infamous full-page ad in the Hollywood Reporter which labeled stars like Marlene Dietrich, Greta Garbo, Kay Francis, Fred Astaire, Joan Crawford, and Katharine Hepburn, as box office poison. 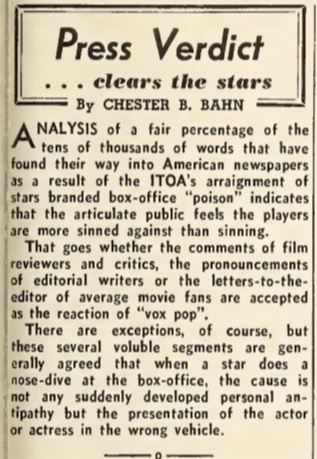 Harry Brandt, who wrote the ad on behalf of ITOA, criticized movie studios for putting stars, “whose dramatic ability is unquestioned, but whose box office draw is nil,” in major productions. The “box office poison” hook was a catchy one and it quickly caught fire. For an ad that was run in a trade publication and was specifically directed at people working in the industry, the ad got a surprising amount of attention outside of that circle. Within four days of the ad’s initial publication, the story was reported on by over thirty newspapers across the country with some of those papers publishing multiple pieces about it. If anyone was hoping the commotion surrounding the box office poison ad would quickly die down and be forgotten, they were in for a disappointment. It was significant enough to merit a mention in Louella Parsons’ year-in-review column published on December 31, 1938. In fact, it was the first event to be mentioned in her column, ahead of other notable stories such as Jackie Coogan suing his parents for squandering the money he earned as a child actor, Clark Gable announcing he was getting a divorce to marry Carole Lombard, and Hedy Lamarr’s rise in popularity. In May 1939, Movie Mirror magazine published a “where are they now” article about the stars mentioned in the ad to investigate whether or not they really lived up to the “box office poison” moniker. The conversation continued into 1940 with Harry Brandt being forced to defend the ad a year and a half after its publication when Ed Sullivan called it an attack on the stars. Over 80 years later, the box office poison ad now occupies its own place within film history; a very rare feat for a trade ad. With so many iconic stars from the 1930s included in it, anyone with an interest in classic Hollywood has likely heard of it. And thanks to a memorable scene in Mommie Dearest and a reference in FX’s Feud: Bette and Joan, even people with a passing knowledge of Hollywood history have a basic awareness of it. After all these decades, the ad is still a fascinating topic to revisit. While being labeled “box office poison” became a career-defining moment for some of the stars mentioned, it barely made an impact on the legacies of others. What’s even more interesting is to examine the careers of each star mentioned in the ad to see exactly what was going on in their careers in the time leading up to the ad’s publication. Were their careers really in such bad shape or was ITOA overreacting? Might there have been other factors that led to their inclusion in the ad? This post is the first in a series where I look at just that. Stay tuned for posts about the careers of Greta Garbo, Joan Crawford, Marlene Dietrich, Katharine Hepburn, Luise Rainer, Kay Francis, John Barrymore, Dolores del Rio, Fred Astaire, Mae West, Norma Shearer, and Edward Arnold during the year 1938 and whether or not the ad shaped their careers going forward. All I know is that Astaire made “Carefree” in 1938 and that’s one of the best screwball comedies I’ve ever seen. That’s what kinda makes me wonder if this list wasn’t just made for publicity. I mean, 1939 is still considered Hollywood’s Golden Year, so many of the celebs listed on the poison list were in fact working on films that would soon become legendary. Thanks for this one! I never knew exactly when that “box office poison” ad appeared so I’m grateful to you for finally giving me an exact date. © The Hollywood Revue, 2010-2019. Unauthorized use and/or duplication of this material without express and written permission from this blog’s author and/or owner is strictly prohibited. Excerpts and links may be used, provided that full and clear credit is given to The Hollywood Revue with appropriate and specific direction to the original content.